The increasing availability of data in the current information society has led to the need for valid tools for its modelling and analysis. Data mining and applied statistical methods are the appropriate tools to extract knowledge from such data. Applied Data Mining: Statistical Methods for Business and Industry provides an accessible introduction to data mining methods in a consistent and application-oriented statistical framework. It describes six case studies, taken from real industry projects, highlighting the current applications of data mining methods. 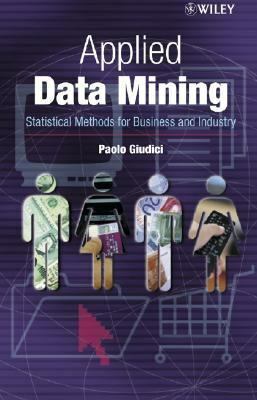 Provides an introduction to data mining methods and applications. Includes coverage of classical and Bayesian multivariate statistical methodology as well as of machine learning and computational data mining methods. Includes many recent developments, such as association and sequence rules, graphical Markov models, memory-based reasoning, credit risk and web mining. Features a number of detailed case studies based on applied projects within industry. Incorporates discussion of data mining software, and the case studies are analysed using SAS and SAS Enterprise Miner. Accessible to anyone with a basic knowledge of statistics or data analysis. Includes an extensive bibliography and pointers to further reading within the text. Applied Data Mining: Statistical Methods for Business and Industry is primarily aimed at advanced undergraduate and graduate students of data mining, applied statistics, database management, computer science and economics. The case studies give guidance to professionals working in industry on projects involving large volumes of data, such as in customer relationship management, web design, risk management, marketing, economics and finance.Giudici, Paolo is the author of 'Applied Data Mining Statistical Methods for Business and Industry' with ISBN 9780470846780 and ISBN 047084678X. Loading marketplace prices 2 copies from $13.79 How does the rental process work?